Grand Teton National Park sits just 15 miles south of Yellowstone National Park, and just north of the popular resort town of Jackson, Wyoming. In peak season, Jackson swells in population, becoming the largest city in Wyoming. Despite this, GTNP is often treated as an afterthought for many Yellowstone visitors. This is a mistake. I have written about how I try to avoid overcrowded situations in our National Parks, and Grand Teton can at most times be a respite from sitting in the traffic jams of its more popular northern neighbor. The Teton Range is like something out of a fantasy painting. Snow-capped Alpine Mountains that rise over 2,000 feet from the valley floor of Jackson Hole, which itself sits 11,000 feet above sea level. Grand Teton Peak rises to a total height of nearly 14,000 feet. I have a friend, a professional photographer, who has documented this wonderland with thousands of photos and in viewing them I am constantly reminded of the beauty here. So there was no way we were passing through this area of Wyoming without going through the Tetons. We checked out of our cabin at 7 AM and drove back into Yellowstone, which was necessary for us to reach Grand Teton. Traffic through the construction wasn't as bad that early, so we had a little extra time to pick up the part of the Lower Park Loop Rd we had missed the night before. Since the Old Faithful complex sits on that section of road, and it was still early in the day, we decided to stop in to the visitor center there and get our stamp (each visitor center has a unique stamp cancellation so we try to collect them all). Crowds weren't too bad yet, so we parked and saw that the geyser was set to erupt in 15 minutes. Heather grabbed her camera and headed for the bleachers, and I went inside to stamp our journals. Just as I finished and turned around, Old Faithful was blowing. I snapped a photo through the massive picture window and then another from outside, but it was already losing steam (pun unintended). Next we made the short drive between Yellowstone and Grand Teton along the John D. Rockefeller Memorial Parkway, but not before passing a very serious car/motorcycle crash just before the South Entrance of YNP. I said prayers for those involved. It looked pretty bad. We drove only half of the main roads in GTNP, skipping the spectacular Snake River Drive (U.S. 191 through the east side of the park) due to time constraints. I don't recommend skipping that as the views are breathtaking. But we had seen it before and had to make sacrifices. There was plenty to do on the part we did travel. 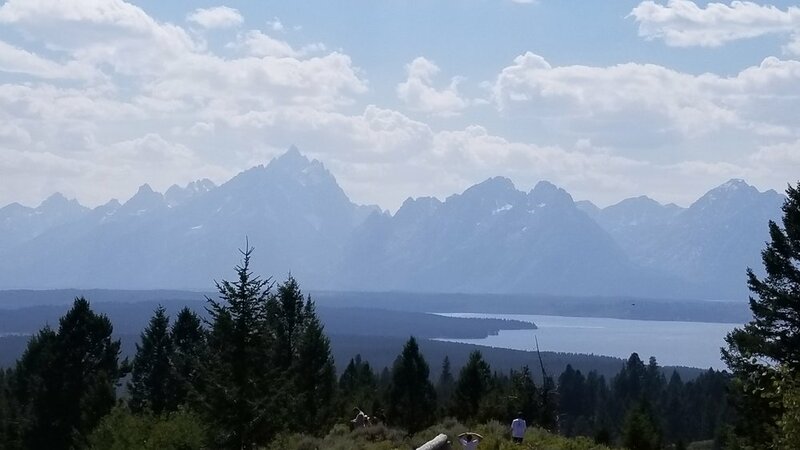 Travel tip: if you want to see the majesty of the Tetons for free, drive the U.S.191 portion that we skipped...there are no entrance stations along that route. If you have already paid the entrance fee for Yellowstone, you can also enter GTNP from the North for free, and see all of the park, if you stick with one Loop and don't need to re-enter through another gate. This is a great option if you are just passing through. We were able to make stops at most of our favorite spots in the park. This was our third time through so we actually knew what we were doing...somewhat. We stamped our journals at all 3 visitor centers, stopped in for reflection at the Sacred Heart Chapel (an active Catholic Church in a log cabin within the park), took some photos at Jenny Lake, and made the 5-mile winding drive up Signal Mountain for 360-degree views of The Tetons and Jackson Hole. The only real disappointment about the day was our lack of time, and the haze that hung in front of the mountains (which was actually smoke from wildfires burning to the northwest of Yellowstone), washing them out to the view and making any truly spectacular photographs impossible. Earlier I mentioned my photographer friend, I realized while I was there that I really never need to take another photo of this place as long as I can look at his. We reluctantly drove on south and west, out of Jackson Hole, over the mountains, and on through the night into Idaho. Tomorrow we would finally be seeing the first show of the trip, which is of course why we are doing all of this. I am pretty sure we are coming back here to the Greater Yellowstone area next year to spend some more concentrated time. And I will miss it every day until then.